Boutique caterer, bartlett mitchell, has been awarded the eat out eat well gold award for best practice in healthy eating at its Fidelity site in Surrey. Awarded by Surrey County Council, the eat out eat well award spotlights and rewards businesses that are committed to making it easier for customers to make healthier choices when eating out of home. 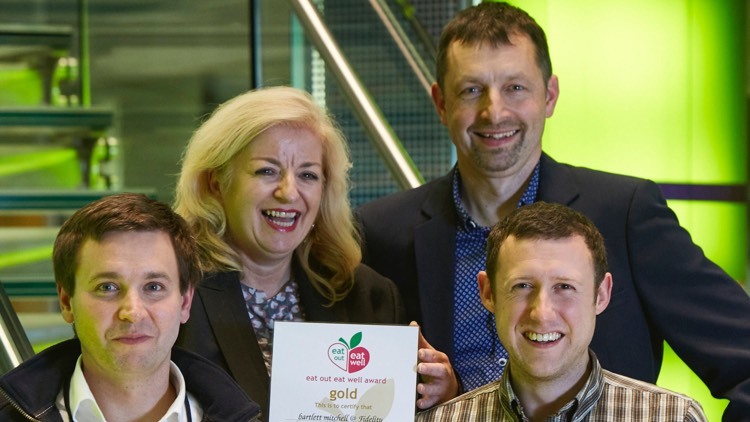 With three levels of recognition, bronze, silver and gold, the bartlett mitchell team at Fidelity has achieved the highest accolade available and customers can be assured of the quality of the healthy choices on the menu. The level of award is based on a scoring system that takes into account the type of food on offer, cooking methods, and how the meals are promoted to customers. To secure the gold status bartlett mitchell demonstrated ongoing excellence and proficiency in the areas of: keeping the level of fat, salt and sugar to a minimum across the menu; making fruit and vegetables clearly available; increasing the availability of starchy foods such as bread, rice, potatoes and pasta; providing healthy and nutritious food for children, where served; employing an appropriate sales promotion and marketing strategy that supports healthier eating; ensuring all catering and food serving staff are knowledgeable about the eat out eat well award; and maintaining good food hygiene standards.